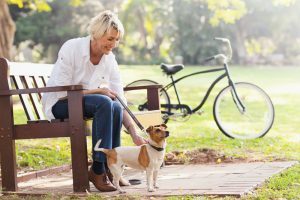 Retirement is probably something you’ve been dreaming about for years – and we don’t blame you. Some want to escape to a sunny beach or calming mountain top, while others just want to sip coffee on their porch in the morning and escape the rat race. We’re here to help make that happen. With all of the retirement tips floating around, we know it can be overwhelming. There’s loads of information out there and different approaches you can take. We want to make it easy for you. Here’s a simple step you can take to see if you are financially ready to retire: Test drive retirement. Identify all your sources of retirement income -- social security, your 401k, savings, and pension. Determine your monthly income from those sources. Here’s where the “test drive” part comes in. Set that as your new monthly budget and continue to work. To be sure you can handle any peaks in expenses, such as holiday expenses and vacations, keep working for six months to a year and see how comfortable you are with your expected retirement income. If you’re financially comfortable after your “test drive,” that might mean you’re closer than you thought to calling yourself a retiree! Debt: A four letter word that makes most people nervous and uncomfortable. No matter what the amount is, it can have very negative effects on relationships, well-being, and overall quality of life. 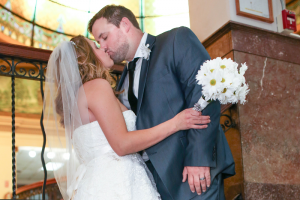 We chatted with COUNTRY Financial employee and recent newlywed, Alexandrea Davis to discuss the topic. She’s a media relations specialist, personal finance blogger, and money-saving queen. Q: How did you and Jason get the money conversation started before getting married? A: From the start of our relationship, it became apparent that I’m the frugal one. We openly discussed our spending styles and positions. We both had very different upbringings so we’ve definitely had to work to find an appreciation and value in one another’s perspectives on money. Jason does a solid job of tipping the scale in the way of improving our quality of life. He appreciates having nice things, whereas if it were up to me, we’d only shop at thrift stores and we’d live in a 400 square foot house off the grid. Our happiness though, is found in compromise. Q: What are some ways you cut costs during wedding planning? A: We scheduled our ceremony during an offseason and on a weekday rather than a Saturday. We chose a casual dinner afterwards at our favorite hometown pub and grill. We kept the guest list at 50 and preselected menu items to keep the price point in check. I shopped thrift stores for décor. We used a big-box office superstore for our printing needs. We found his designer suit on deep discount at a local department store, while I bought my dress online and it came with free shipping. But the biggest way we kept costs low was by sticking to our boundaries. We didn’t cave towards what others wanted for our wedding and we weren’t open to conforming to social expectations. This sparked many uncomfortable conversations along the way, so eventually we just kept our plans to ourselves. Q: If you could change anything about the way you budgeted for your wedding, what would it be? A: I think we could have done with even less… maybe even fewer people – our conversations with guests could have been longer and more intimate. Q: Why is it important to you and Jason to fight debt? A: I know what financial insecurity feels like and I refuse to ever feel that way again. We want to live our life in a way where we never have to borrow money or allow our possessions and the need for more to rule our lives. Q: What are some debt-busting tips that you would share with newlyweds? A: Have the money talk early on. Keep an open mind. Figure out how one another feels about debt and borrowing – do they have any outstanding debts? Are they fiscally responsible? Do they bounce checks, miss bill payments, know their credit score etc.? Learn about the things that shaped them into who they are as a consumers today. Determine if they’re the saver or spender, then determine which partner will be the best at keeping the household bills in order while still getting input from their spouse. Create and follow a budget. Have some other debt-busting tips to share with us? Leave us a comment below! Owning a home is the first step toward building your family’s future. 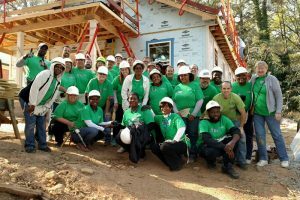 Our employees and representatives support Habitat for Humanity because it sets families up with a financial foundation. Homeowners can rest easy in their new home knowing they’ve taken the first steps to financial success. This past year, our people built beautiful Habitat for Humanity homes for families in the Minneapolis-St. Paul, Atlanta, Bloomington, Richard, WA and Spokane areas. Volunteers help with a variety of tasks including laying the foundation, painting the home and landscaping. Join us in supporting Habitat for Humanity’s amazing work. Share this story on your social media channels and tag someone who might like to volunteer. Farm-to-table is an effort that started in very small communities. This movement promotes serving local food as often as possible – no matter where it is. Hometown restaurants and even school cafeterias have taken advantage of this for years. People love to know that their food came directly from the creator whether it’s a family farm, brewery, ranch, or winery. We’re all about this idea, too. That’s why Chicago Gourmet is one of our favorite events of the year. 2016 was our third year partnering with Chicago Gourmet, and our second year as the Title Sponsor of the Beer, Bourbon and BBQ Pavilion. “It’s a world class celebration of food and wine, and is an ideal opportunity to meet the 11,000+ attendees for the weekend-long event. Our goal in 2016 was to really emphasize our commitment to Illinois Agriculture,” COUNTRY Financial employee, Jamie Byrd said. Jamie coordinated the event, making sure everything from green sake cocktail to the rustic decorations were absolutely perfect. We accomplished this by partnering with a local Chicago Chef, Kevin Hickey of the Duck Inn. He served as our spokesperson for Chicago Gourmet and spoke about COUNTRY Financial in TV and Radio interviews. He also participated in a Q&A session with invited COI’s and food influencers, where guests learned about our roots in agriculture. Kevin spoke about farm-to-table’s staying power, saying, “Farm-to-table is a given. We buy from family farmers and the food is unlike anything you’ll find in grocery stores. Some may think it’s a trend, but it’s here to stay.” Check, Please! 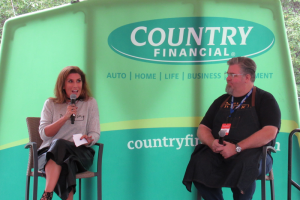 host, Catherine De Orio also joined us to chat about delicious farm-to-table restaurants in the city. In her mind, everyone is already on board with farm-to-table, or they’re trying to get on board. 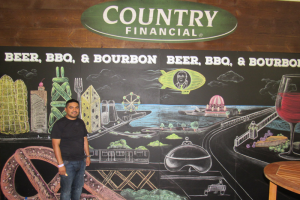 Live chalk art, a COUNTRY-branded Snapchat filter, delicious food and drinks, social media influencers and foodie bloggers, and conversation with wonderful people helped bring this movement to life. We already can’t wait for next year! Be sure to add Chicago Gourmet to your bucket list. Every year, Tammy Hanson plans an annual meeting with all employees to discuss objectives, successes, areas of improvement, and goals for the upcoming year. After business is taken care of, they hang up their business wear and let loose. Last year, letting loose meant having a curling competition! Sliding stones on a sheet of ice – targeting an area separated into four concentric circles. It doesn’t sound like your average work meeting, does it? 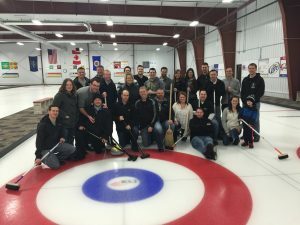 In an effort to celebrate a tremendous year and reward her hard-working employees, Tammy began brainstorming fun and out of the ordinary social events that could be the concluding part of the annual meeting. Tammy’s son is part of a curling league, so that’s where the suggestion came from. work together to accomplish a goal was really fun. We see this happen with our agency goals as well. Each rep has their own goals that they strive for, but they are always trying to work together as a team to make sure we meet our goals as an agency as well. They not only want to succeed individually, but they want to succeed as a group”, Paula said. So, what’s on the agenda for next year’s meeting, Tammy? Broomball? Race Walking? Handball? No matter what it is, we know you’ll be working together as a team while having lots of laughs. If you’re thinking about flying with your pet, keep in mind that taking pets on commercial airlines may be difficult unless the pet is small enough to travel in the cabin. However, if that’s not possible, these tips can help make it a safer and easier experience for you both. Fly direct. Book a direct flight whenever possible to help reduce the chance of delays or having your pet mistreated. This can also reduce the chance of your pet being left on the tarmac in bad weather during transfer. Check with your veterinarian. Take your pet to the veterinarian to make sure your pet is healthy and up-to-date on vaccinations. Some airlines and hotels may require health or vaccination records. Call ahead to find out if you’ll need documentation. ID, please. Your pet should wear a collar and ID tag that includes your contact and destination information. Collars that break away when caught on something are best for cats. 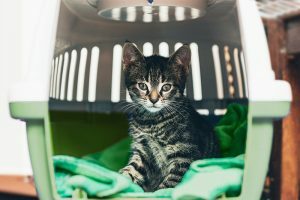 You might also want to consider microchipping your pet before leaving. Get a crate. Purchase a USDA-approved shipping crate that’s big enough for your pet to stand, sit and turn around in comfortably. You can shop for one online or at a local pet supply store. Label your pet’s crate. Write “Live Animal” on the top and sides of the crate and clearly mark which end is up with an arrow. You should also write your pet’s name along with your contact and destination information on it. Add a photo. Glue or securely tape a photo of your furry friend to the crate for identification purposes. This can be a lifesaver if your pet manages to get out its crate. Also, keep a photo of your pet on you at all times! Prep the crate. Line the crate with some type of bedding, like shredded paper or towels, to absorb any accidents. When you close the crate, you’ll want to make sure the door is secure—but not locked—so airline personnel can open it in an emergency. Avoid tranquilizers. According to American Veterinary Medical Association, tranquilizers are not recommended because they can hamper your pet’s breathing. Check with your veterinarian if you have questions. and flight attendants, that you’re traveling with a pet in cargo so they’ll be ready in case any special attention is needed. We were born on the Illinois farm in 1925 and Marji is someone who is living out our values. We did a Q & A with her to learn the inspiration behind her purpose. What encouraged you to start FarmHer? In 2013 I came to a point in my career where it was time to make a change. I wanted to spend more time with my kids who were 1 and 3 and take some time to figure out where I would go next with my career. The very weekend after I made the life-changing decision to leave my career in the insurance industry, the Super Bowl was on. One of the commercials on that year was “God Made a Farmer”. 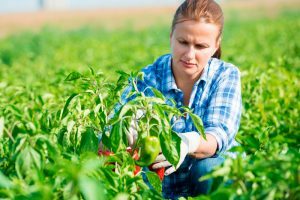 A two-minute-and-thirty-second commercial about American agriculture only held three, somewhat hidden, images of women. However, by the 2012 Census of Agriculture, women make up about 30% of ag producers in the U.S. This hit me hard. 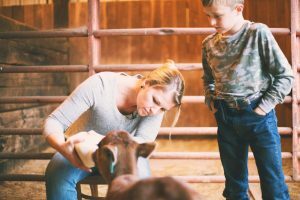 In the spring of 2013, I started a photography project called FarmHer. I began photographing women in Central Iowa. I started a website to share those images, and a social media campaign. The instant reception – mostly from women in agriculture – was heartwarming. It validated the work that these amazing women do – the very real work of farming, ranching, operating a business, defining the culture that is agriculture, raising families, growing food, and feeding their communities. How has FarmHer grown over the years? Today, FarmHer has grown into a place where women in agriculture can connect and be a part of a community built just for them. It’s the coffee shop, corner store, and kitchen gathering for all women. 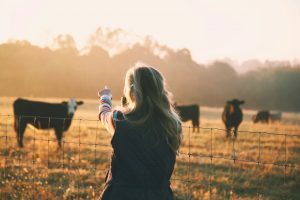 The business side of FarmHer includes a line of merchandise, an online social network, events to connect young women to future roles in agriculture, outreach, and most recently a weekly television show, airing on the national cable network, RFD-TV, that has been picked up for multiple seasons and airs weekly to an audience of 50 million homes nationwide. What have you learned along the way? I have learned that agriculture isn’t one type of farm, or one type of person. Agriculture is a culture that is made of all different types of people and all different types of farms, that together, form our food and fiber systems. It’s the woman driving a tractor down the rural road late at night during fall harvest. It’s the woman riding a horse or a four wheeler, driving a herd of cattle. It’s the woman dropping off kids in the line next to you at school. It’s the woman working at a desk, making sure farmers are insured or have access to the necessary credit. It’s the woman at the grocery store buying food. It’s the woman raising food to feed her family, her community, her world. It’s the woman who is drawn to the land or with a love of animals. Want to give a shout-out to a woman in agriculture by thanking them for what they do? Tag them in the comment section and share this article. 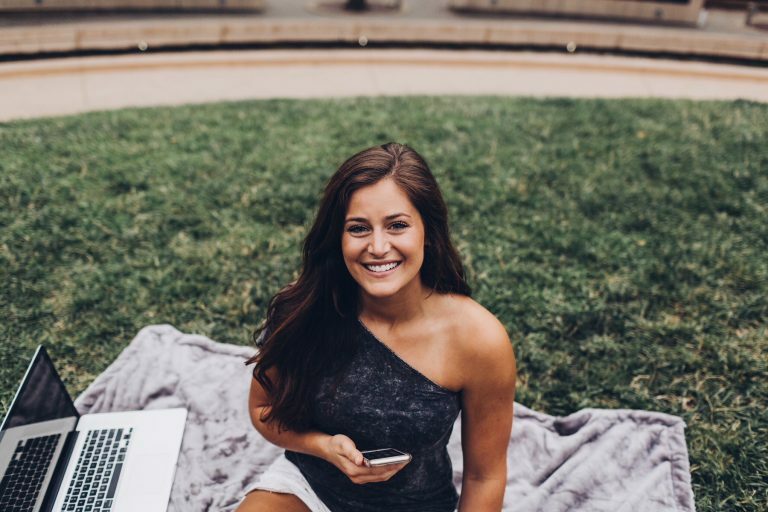 Interested in learning more about FarmHer? Check out our other article! 4 years ago, Marji Guyler-Alaniz founded FarmHer. FarmHer is a place where women in agriculture can connect and be a part of a community built just for them. Make sure to check out our recent Q&A with her in case you missed it. There’s a lot of buzz around the misconceptions and myths of modern agriculture. We asked Marji for her take. What do you think the average person can do to spread awareness about these misconceptions? Sharing what you do and how you do it is the best way for anybody to help connect consumers to agriculture. The way our food system is organized, most people never have and never will get to experience a farm. They won’t know the ins and outs or ups and downs. They will never lead that life. But, by sharing a little bit of yours they might be able to better understand or at least see what agriculture is. If someone wants to get involved with agriculture, where do you recommend they start? Follow a blog or join a group on social media. Join an industry group. Go to a conference or event and listen to a speaker. Engage with that speaker. Get involved with Future Farmers of America. Volunteer at a local Community Supported Agriculture. Reach out to a farmer to have a discussion. There are countless ways to get involved and sometimes just taking the first step and putting yourself out there is all it takes. Telling stories about our farming heritage is important to us. Have any questions about modern agriculture? Our farm and crop team would love to help answer these questions in a future COUNTRY Financial Connect article. Leave them below! Baling the hay. Milking the cows. Ploughing the fields. According to United States Department of Agriculture, there are 969,672 women (and counting!) that are breaking the molds by keeping up with these duties on the farm. Think they can’t keep up with the men? Think again. Mariah Anderson, COUNTRY Financial employee, started showing livestock at the age of 8. She admits that she was hooked as soon as she took her first Ag class in high school, and became a member of Future Farmers of America. In the 1930’s, girls were prohibited from being a FFA member. In 1969, that finally changed. And today? More than 44 percent of FFA members are female, and women hold approximately 50 percent of state leadership positions. The confidence in female farmers and the community that they are a part of is contagious. Whether you know a woman who is a full time farmer, a hobby farmer, or an advocate for agriculture in some other way, give them a shout-out and thank them for changing the face of modern agriculture.